A cataract is a common condition that causes a clouding of the eye’s lens,and affects millions of people each year, including more than half of all Americans over the age of 65. The natural lens inside the eye is clear at birth, but as we age it yellows and hardens. The cloudy lens tends to progress with time and may interfere with the ability to drive, read, or watch TV. This condition is usually a result of the natural aging process. Since a cataract affects the clarity of the lens, it prohibits light from passing through easily. This causes the retina to receive blurred or distorted images. Everyone will develop cataracts at some point, usually after age 60. While more common in older people, cataracts may also be caused by injury, certain drugs or may be inherited. With cataracts a change of glasses can sometimes help, but eventually surgery is required to restore vision. Corrective cataract surgery can be undertaken when a patient is unhappy with their ability to see and the surgeon has decided cataract removal will be beneficial. Have you noticed changes in your vision that may be caused by cataracts? With a thorough eye exam, our experienced, caring staff will diagnose the issue and guide you toward the best decision for your health and vision. We perform various tests to diagnose the eye condition. Typically, a dilated eye exam tests your vision and examines the condition of the lens and other parts of the eye. We can also answer any questions you have about cataracts or what to expect with cataract surgery. 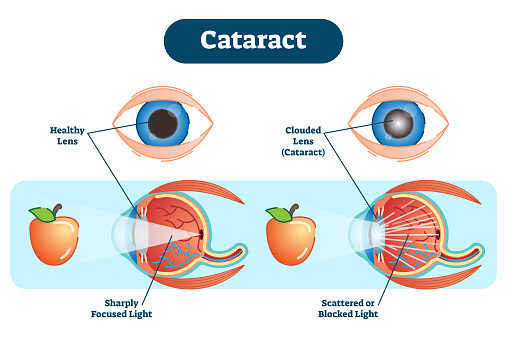 Read more about cataracts. Cataract surgery is a simple outpatient procedure and is one of the most commonly performed surgical procedures in the U.S. In fact, it has one of the highest success rates of any type of surgery. During the cataract procedure, your clouded lens is removed and replaced with a clear artificial intraocular lens implant (IOL). Cataract removal is performed through a procedure called phacoemulsification. In this procedure, high-energy ultrasound waves are used to gently remove your cataract. Cataract surgery can restore your vision and your ability to read, work or do the things you enjoy. Read more about cataract surgery. IOLs have been available since the early 1980s. Before the use of intraocular lenses, if you had cataracts removed, you had to wear very thick eyeglasses or special contact lenses in order to see after cataract surgery, since no device was implanted in the eye to replace the focusing power of the natural lens. Today, there are a wide variety of advanced IOLs that may reduce your dependency on glasses after surgery. The best intraocular lens for you depends on many factors, including your lifestyle, expectations, and your specific visual needs. For example, how much reading or computer work do you do? And what do you hope to achieve? During your visit, your surgeon will discuss all of your options and recommend the IOL that is best for you. Monofocal – generally for distance vision. This lens is the only lens which is covered by insurance.